There will be car parking at the campus, although as the car park exit crosses the race route, cars will not be allowed to leave until the race finishes – and not before 12:30 at the earliest. 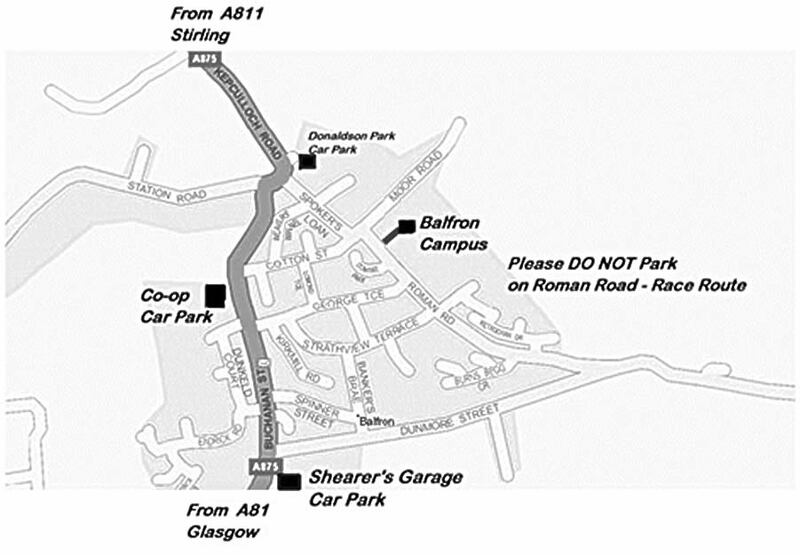 Alternative car-parking is available at Shearer’s Garage, the Co-operative car park, or the Donaldson Park car park, all around 5 minutes walk away (see map below). Please DO NOT use the Golf Course car park. Alternatively there is on-street parking available but PLEASE DO NOT park on Roman Road – as this is part of the race route! Please show consideration for local residents when parking – Balfron is not accustomed to so many visitors!